I just downloaded OS X Mavericks for my MacBook Pro. I don't know if this is a unique problem, but the screen brightness is automatically adjusting on it's own. If I set it for about half the bars (50%), I'll be working, then notice that the screen is brighter than normal. I'll check and it'll be at 75% or higher. Then, when I open the MacBook from sleep, sometimes the brightness is at 100% and sometimes it'll be 10%. What gives? Is there a automatic adjust brightness setting on the new OS that I need to turn off? There is an automatic brightness adjustment setting, but it's not new to Mavericks. 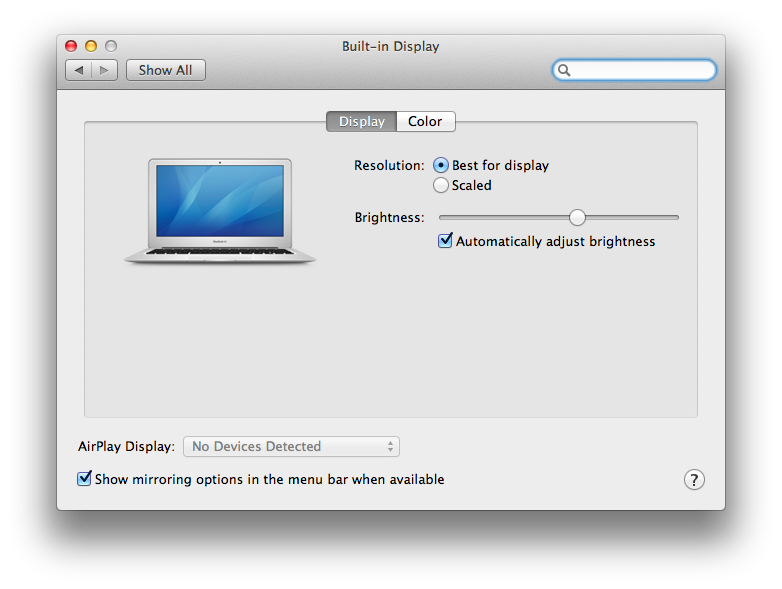 In System Preferences, check Displays; the setting is called "Automatically adjust brightness". It adjusts based on a light sensor near your MacBook's built-in camera. I've found it to be fairly good, but occasionally tipping my MacBook Air's display back a little further back than usual will make the light sensor detect more light and brightens the display considerably. Sorry for the 'me too', but my 2012 MBA started to behave like that after upgrading to Mavericks. That is, with stable ambient lightning conditions, the screen background lightning is fluctuating. When I open the Preferences/Displays panel, I can see the slider move up and down by itself. I eliminated the symptom by unchecking the "Automatically adjust brightness" box, but it seems like a bug in Mavericks. Not the answer you're looking for? Browse other questions tagged macos mavericks display . Why isn't my iPhone automatically adjusting its brightness?